This might be the most brilliant thing a Reddit user has done in a while. To curb the pain of the "do I need a visa?!" research headache, udit99 made a no-frills website called VisaMapper. 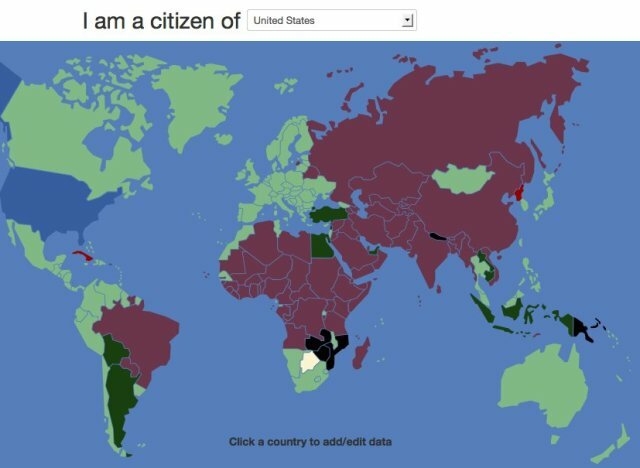 Visitors select their nationality from a drop-down menu and instantly see, on a color-coded world map, which countries require a visa for them to visit and which don't. Tell VisaMapper you're of Swedish citizenship, for example, and watch loads of nations on the map turn to happy shades of green. This color means you won't need a visa to visit them. Say you're from Afghanistan, though, and everything -- with the exception of Haiti and a few small islands -- goes instantly maroon to tell you that "a visa is required prior to arrival." A few countries are missing from the site, and you should double-check its data with the State Department before traveling, but the map is nevertheless addicting... and educational. Play around with it to see what travel is like as a citizen of different countries.